Have you ever listened to a world-class musician and wondered how he is able to play with such grace and precision? Do you imagine the years of study and countless hours of diligent practice that such virtuosity requires? Or perhaps you have watched elite Olympic athletes and marveled at the dedication and discipline it took to get to that level of competitiveness. Excellence in any arena demands a commitment to regular practice. This, of course, includes writing. There’s no way around it. Writers improve the same way musicians, artists, and athletes do — by hard work and regular practice. There is, however, another important ingredient in improving skills: the assistance of knowledgeable instructors. Virtually all master musicians and champion athletes can point to instructors and coaches who guided them along the way, nurturing their talents. The input of experts is essential to developing natural abilities. WriteAtHome is designed with this basic philosophy in mind: Improved writing comes with both regular practice and expert feedback. It’s just common-sense. We offer no startling new techniques. No secret formula to make graceful, effective writing easy for everyone. Writing well requires writing often and getting help from more experienced writers. Leave out either part, and your writing will suffer. “Practice doesn’t make perfect,” my old high school coach once said, “only perfect practice makes perfect.” Practice without instruction and advice can even be detrimental — like a basketball player who shoots two-handed, or a golfer with an awkward swing. Without a coach to correct their technique, these athletes will never reach their potential. In the same way, you might write pages every day, but without a gifted teacher or editor, you might never identify and overcome your problem areas. Young writers often get discouraged about their writing. Writing well seems so complicated. There always seems to be something to correct or improve. Far too many students just give up and assume they just don’t have what it takes. What they don’t realize is that writing skills grow incrementally, sometimes so gradually that you barely notice the improvement as it comes, over time. A good writing coach knows this too. He knows that students will make the same mistakes over and over before good habits start to replace the bad. The important thing is to keep at it. 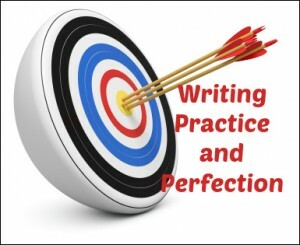 WriteAtHome has shown consistent success with young writers because we understand these two essential components to sound writing development: practice and expert feedback. We consistently see growth in both skills and confidence. Whether you use WriteAtHome or not as part of your writing education program, keep these key components in mind as your students work to write better and better. Bloggers love comments. Leave yours below!